Not all clowns are humorous. They don't all wear flower pins that squirt water and not all are skilled at twisting an oblong balloon into an animal. Some clowns have more sinister skills and instead of making people laugh, they prefer making them run away in terror. This prop right here is perfect for those antisocial clowns who like getting stabby more than they like being silly. A supremely scary accessory, this simple prop can elevate any clown costume from basic to frightening because nothing makes us scream like adults wearing full face paint, multi-colored afro wigs, and holding large machete props. This bloody clown machete is designed to look like it has a wooden handle and a very sharp blade (even though it isn't sharp at all.) The "blade" is painted with splashes of red paint, mimicking the appearance of blood spatter. 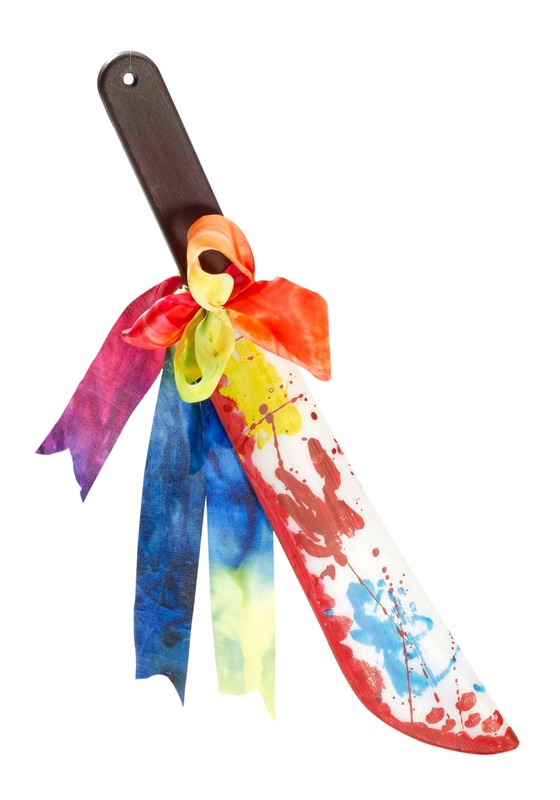 Finally, a rainbow tie-dyed bow is wrapped around the handle because even scary clowns like bright colors. Did you know that Coulrophobia affects 42% of Americans? By pairing this accessory with a scary clown costume you'll guarantee that you'll scare 42% of everyone you meet. Or, err something like that. Math was never our thing!